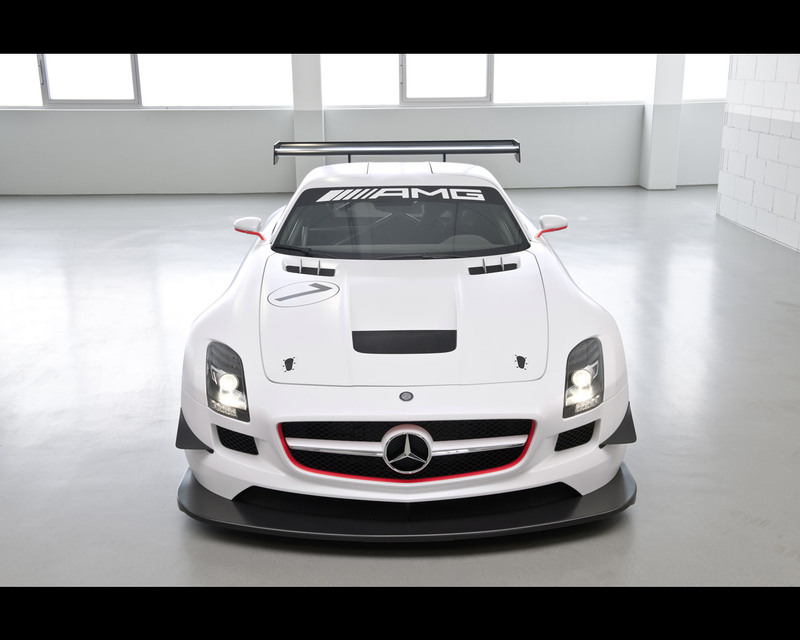 Coinciding with the official market launch of the SLS AMG on March 2010, Mercedes AMG has introduced a GT3 racing variant. AMG, the performance brand within Mercedes-Benz, is entering a new business sector with the new SLS AMG GT3: the development, production and marketing of sports racing cars intended for customers use. Sales of these customer cars are expected to commence in autumn 2010, and homologation of the GT3 variant will be completed in time for the 2011 racing season. The purist design of this gull-wing doors model are emphasized by specific modifications to the bodywork. The new components made mainly from carbon fibre are guided by extensive aerodynamic development work. At the front the GT3 racing car has a new front apron with larger air intakes: the wide aperture below the characteristic radiator grille with a large Mercedes star and a wing-shaped transverse fin supplies the engine oil cooler and brake discs with cooling air. The air intakes below the vertically arranged bi-xenon headlamps have the same function. Down-force at the front axle is provided by four externally mounted "flics" and the carbon fibre front splitter: this blends into the smooth underbody cladding which ends with the rear diffuser. The bonnet has a central aperture to dissipate the engine heat. The hot air is vented in the wheel arches from side vents on the front wings. Particularly lightweight polycarbonate is used to glaze the side and rear windows, and this is also available for the windscreen. The front and rear wings have been widened to make space for the large racing tires. With a width of 1.990 mm, the body of the GT3 is a good 50 millimetres wider than that of the standard SLS AMG. The new side skirts have apertures for cooling the rear brakes. Viewed from the rear, the SLS AMG GT3 impresses with its sheer width. The boot lid is surmounted by a wide carbon fibre rear aerofoil, which has multiple adjustments and allows a perfect setup for the type of racetrack concerned. The new rear apron features two apertures designed to vent the rear wheel arches. The carbon fibre rear diffuser is another eye-catching feature: as an extension to the smooth underbody, it generates a down-force thanks to its shape. 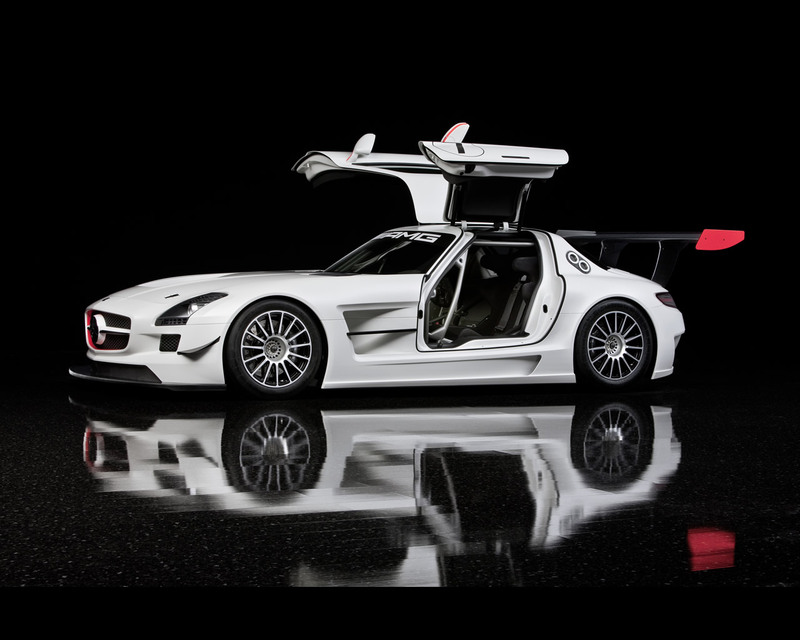 The overall aerodynamic concept of the SLS AMG GT3 was refined and finalized in extensive wind tunnel and racetrack tests. As prescribed by the FIA GT3 rules, the AMG 6,3 litre V8 engine is practically identical to that in the standard model. Thanks to its lower weight, the GT3 racing car will easily better the already outstanding acceleration of the standard model that is 3,8 seconds from zero to 100 kph (62 mph); depending on the final drive ratio, the top speed will exceed 300 kph (186 mph). The interior of the SLS AMG GT3 is dominated by a functional racing car atmosphere: the steel rollover cage not only ensures the driver's safety, but also adds additional reinforcement to the aluminium space-frame. The central display is perfectly positioned in the driver's field of vision, and shows all the relevant information such as speed, engine rpm, operating temperatures, lap times and the selected gear. The open-top racing steering wheel with gearshift paddles allows the driver always to have a clear view of the central display. Rapid pit stops and wheel changes are assured by the pneumatic jacking system integrated into the underbody: four pneumatic jacks lift the GT3 racing car by around 190 millimetres to allow very rapid wheel-changes by the pit crew. The new SLS AMG GT3 was developed to comply with the international FIA GT3 race rules, and is entitled to take part in all GT3 race series - which includes the popular 24 hour race in Spa-Francorchamps (Belgium) or the Nurburgring. Interested customers are able to order the GT3 from autumn 2010, and delivery will take place in time for the start of the 2011 racing season. Homologation will be completed in March 2011.